Christmas is a funny time of year for London’s Jews. For many children who are not in Jewish schools the experience post-Chanukah is of hearing your friends get increasingly excited about Christmas and what Santa will bring. Whether it be snow filled vistas, the sound of Christmas songs (from Phil Spector to Slade to traditional Christmas carols), the Queens Speech or the presents waiting to be opened at the crack of dawn by kids in pyjamas; these remain some of the most endearing images of British society at Christmas. For those children not party to this, for whatever reason, these images can cause envious gazes. Now many Jewish (and other non-Christian) parents feel pressured into creating the full Christmas experience for their children. Santa and his sleigh no longer pass over the muzuzah’ed houses and only drop down the chimneys of the good little Christian boys and girls. And you are as likely to see Rachel or Rupal or Ahmed or Asher sitting on Santa’s knee in his grotto discussing whether they have been good this year! Santa now reassures all children that he will visit them, no matter in what language they pray for their presents! But as the season is about giving, and with this spare time on our hands, what better time to turn our minds to the needs of others. There is no better time for us Jews to give up our time and resources. With that in mind, it was with joy that a few mensches gave up their seasonal break (all 4 days and nights of it) to provide warmth and comfort, love and friendship to some in their community who are less fortunate; a homeless shelter with “all the Christmas trimmings” over the festive period in a synagogue! Surely, this is the true meaning of the giving season. And in giving, there is the privilege of feeling appreciation and the glow of gratitude. This is what is missing in the commercial experience in British society’s festive spirit. Giving should not be restricted to Christmas, or restricted to Christians at this time. In North London, the remarkable work of the same synagogue has set a wonderful precedent. This summer, during Ramadan, the synagogue converted nightly into a mosque for prayers and the breaking of the fast and Iftar celebrations. Every night for the duration of Ramadan, over 50 Muslims came to pray and eat. The Imam’s call to prayer, from the Bimah, echoed throughout the halls. Finally, on one special night, 150 locals from Muslim, Jewish, Christian and Sikh communities came together to sing ‘Salaam, Shalom, Peace’. An unforgettable image of people of all faiths and ages peering over the scrolls on the Bimah in wonder will serve many of us well in the darker days of hatred, bigotry and religious restriction that are becoming ever more frequent in today’s world. 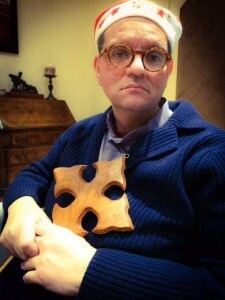 Sadly, some of those darker days have been described by the inspiring Canon Andrew White. He told of a far more sinister tale of the ability and freedom to rejoice. In Nineveh, in this past week, the celebration of birth of Jesus has been an altogether different affair. This vast plain, once the hub of Christianity for Iraq and across Persia, and where Jesus’s mother tongue (Aramaic) is still the language of choice for prayer; the voices have fallen silent and been replaced by the sound of gunfire. Fear has replaced joy. Tragically, for the first time in 2 millennia, the prayers of Christians will be a covert occasion risking lives rather than the overt celebrations venerating life. Andrew is also a great mensch in case you didn’t know. And I’m sure that even at such a busy time for most Christians (especially the clergy) Andrew will still have taken time out to tilt his hat to Chanukah. Somewhere in Israel, Andrew will have been lighting the menorah with as much gusto as any of his more customary duties. 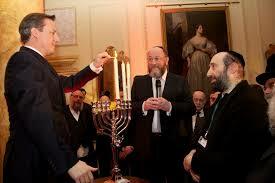 Firstly: to Jewish community in its role in the UK. He went on record to recognise the vast contribution that UK Jewry makes to the wider community plus their extraordinary contribution to the country as a whole. Secondly: to the State and people of Israel. Britain remains a good and candid friend to our state and people. He has pledged that as long as he is Prime Minister this will remain so. Thirdly: to the memory of the Holocaust. Soon there will be survivors of the Holocaust left, so David Cameron (inspired in part by his visit to Auschwitz), dedicated part of his legacy to ensuring that the messages and lessons are never forgotten. UN adopts 20 Resolutions on Israel versus 4 on the Rest of the World combined. Despite the gross and systematic abuses committed by China, Cuba, Egypt, Pakistan, Russia, Saudi Arabia, Sri Lanka, Sudan, Turkey, Venezuela, Zimbabwe, Rwanda etc., the only other countries who received condemnations were Iran, North Korea, Ukraine and Syria (and only one for each of them). Is Israel really 5 times as bad as the rest of the world put together? 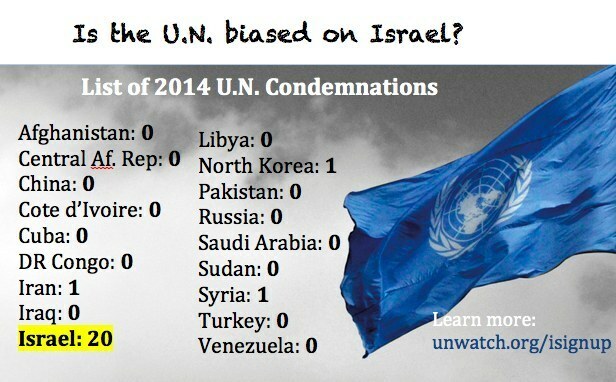 Well seems like the UN think so. At the UN, Christmas is a time for giving, and the UN has certainly given more generously than ever before to the State of Israel. Unfortunately the receiving has not been greeted with the same enthusiasm as the giving. This entry was posted in Uncategorized and tagged Christmas, David Cameron, Israel, Middle East Christianity, Religious fundamentalism, Terrorism, UN, UNWatch on December 30, 2014 by admin. Matthew Parris, a venerable writer in The Times and former Conservative MP, made the assertion in the aforementioned paper that we are all just a bit over anxious and losing perspective about the egregious attacks (in Australia, Pakistan and France) of the past week. He feels that the public and the media unfairly play the racial card on this and, especially in the US, overreact to the events. Matthew’s research led him to the intriguing fact that there are more Americans dying from wasp stings than from religiously driven beheadings, by a factor of 11 to 1. The numbers are undeniable. 55 US citizens died as a result of a sting or stings from an insect last year, whilst during the same period 5 US citizens were murdered by barbaric extremists. There are so many ways to dissect this but none of them support Matthew Parris’s rationale. Furthermore, this ongoing apologist view of race-based hatred and murder seems to be gathering far more pace than it should. a) 5 American citizens “only” are killed a year because the US has to spend billions of dollars to prevent daily massacres of biblical proportions by terrorists mainly driven by Islamic narratives. b) Trivialising murders by terrorists by comparing to attacks by wasps is massively disrespectful to those who are victims of terror attacks. A friend of mine is, at this time, remembering the 4th anniversary of being the victim of a Palestinian terrorist kidnapping, being stabbed 14 times, being left for dead whilst witnessing her friend being brutally murdered. The still far too frequent terrorist events such as these are, I suggest, not the same as being stung by a wasp. A wasp is an insect. It attacks as a basic reaction to an imminent threat. That is NATURE. Humans rarely die from a wasp sting as it we have enough body mass and protection to render the sting a mere irritation. Beheadings are the result of a specific philosophy and upbringing. That is NUTURE. Humans rarely survive a blow with a knife to the neck. One criticism levelled by all sides is that there are numerous tracts within religious books of many faiths that speak of violent and belligerent acts. Unquestionably these tracts exist. They are not obscure but relatively clear. However, responsible society has learnt to moderate and interpret these stories for what they are; stories not instructions. They represent a different time when barbarism and violence went unchecked and the moral compass had no direction. In Christianity and Judaism no one is using these violent tracts as “just cause” for murder or punishment. The Old Testament talks of stoning, an eye for an eye, ritual slaughter, yet I have never heard a rabbi or a vicar demand that we implement these actions or encourage such behaviour (nor, I am sure will I ever). Actually, the contrary is usually the case when I listen to rabbis sermons of such events. These stories act as a reminder of how not to behave. There lies the fundamental difference with fundamentalists. The liberals seem all too keen to excuse the Sydney café murders as a one off “lone wolf attack” (despite three vehicular terror attacks in France this week done with similar intent and intonations). This was just a madman. The Islamic flag, the screams of “allah akbah” were just a fashion not an extolling of intent. In Pakistan, when there is no denying that religion was the justification to murder innocents in their classrooms, everyone appeased the notion that religion was involved by denying it was their religion. So, to the crux of the matter. Within religion, there are all manner of aspects of humanity. It does depravity as well as beauty. That is our nature. But only the evil in mankind has the ability to nurture the horrors. Stop that nurture. Rather than trying to excuse it, we need to be brave and confront it. Matthew Parris feels that ISIS, Islamic Jihad and the like are trying to draw us into a holy war by trying to associate murders with religion. If we keep on denying it, it will continue and proliferate. This entry was posted in Uncategorized and tagged David Cameron, Matthew Parris, Religious fundamentalism, Terrorism on December 23, 2014 by admin.